This simple recipe for immune boosting jello is the perfect winter treat for kids or adults! I have never made homemade jello until this week. The only jello I have ever had came from a box. And even then, it was rare for me to make jello. But since researching the benefits of gelatin and wanting to get more it in my diet, I decided to make some. Why is this immune boosting jello? I added some elderberry syrup. Elderberry syrup seems to help support the immune system. It increases production of cytokines (immune modulating agents) to help stimulate the immune system to go to work. source source Elderberry syrup is a great natural way to enhance your immune system as we enter into the winter months. 2 cups (minus 2 Tbsp) 100% organic juice - This is the juice I used, but you can substitute another juice. I have also used Ningxia. Directions: In a small sauce pan, proof your gelatin by adding it to the juice and let it sit for about 2 minutes. Add the honey and heat the mixture over medium heat for about 3 minutes. It does not need to boil, but it should be very hot and all the gelatin and honey should be dissolved. Remove from heat and add the elderberry syrup. Pour into glass dish and place in fridge for a few hours until it sets. You can also add vitality essential oils to this after it has cooled a bit. Heating essential oils decreases their therapeutic benefits, so letting the mixture cool a bit is best. 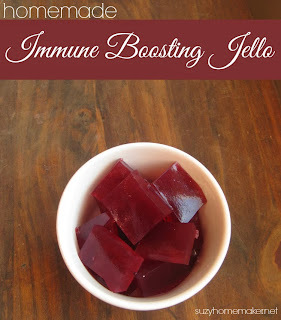 This is a great way to get more gelatin in your diet and also enhance your immune system.